Opening time 07 a.m./01 p.m.-04 p.m./02 a.m. 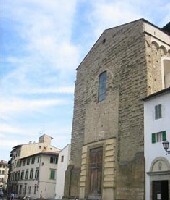 The entrance to the Ospitale is through an internal backyard from Piazza Piattellina n.1. On the first floor, after a flight of stairs, there is the Reception Hall and the Tacca Hall on the right. The management of the hostel is coordinated by the Ospitale delle Rifiorenze Association, in collaboration with Mani Tese Firenze and the Municipality of Florence, in partnership with the Ethical Bank Foundation, Caritas, the Cooperativa Riciclaggio e Solidarietà and the Educatorio Fuligno. Theproject for the Ospitale has received the support of Cesvot (the public center for volunteering in Tuscany) with the Innovation projects call 2004. - Eco-fair catering, for lunch and dinner (on the road as well). Thanks to a partnership with two organisations from the fair trade world in Florence, it is possible to have a catering service both at lunch and at dinner at the Ospitale. It is necessary to book the service, specifying the number of people and the required menu. To enjoy the experience of a social and sustainable turism in the traditional town and in the more contemporary parts of Florence, you may be accompanied by a guide of the Ospitale delle Rifiorenze. These itineraries offer the possibility to get to know not only the beautiful and antique face of Florence, but also the face of the modern city. Florence, as Buontalenti discribed it, is the city of the “good eye” and the “bad tongue”: it is worthwhile to discover it slowly and respectfully, following different paths than the traditionally mass tourist ones. From the train station, from the airport, from the highway... here is how to reach us. From the central train station Santa Maria Novella (900m): bus number 11, 36, 37. Get off at the second bus stop in via de' Serragli. From the train station Campo di Marte (2 km): bus number 19 to the central station. Then follow instructions above. From the Peretola airport: bus number 62 to the train station Santa Maria Novella. Then follow instructions above.